Simplecom EL808 is a multifunction LED desk lamp with LCD thermometer, alarm clock and calendar. Designed for added convenience, it will remind you the time while you enjoy your working, study or reading, no miss for any date. Touch-Sensitive panel controls over power, lightness and color temperature, all done button-free on the touch-sensitive panel. 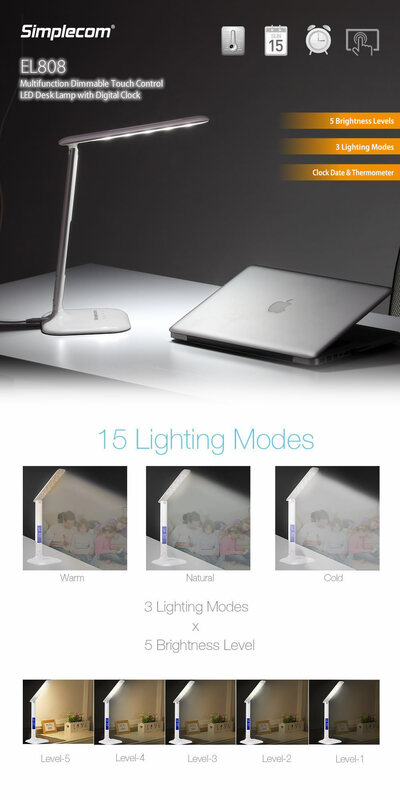 EL808 with 5 Levels Brightness and 3 Lighting Modes: cold, natural and warm modes, cover work, reading, relax and other scenes you need in a whole day, ideal for the office, study, bedroom, and more. High quality and easy to use LED table lamp which is capable of providing a unique and modern day touch with it sleek design.